Partial dentures usually include artificial gums that are made from pink acrylic and false teeth that are mounted into them. These generally replace a section of 3 or more missing teeth and is fastened in place using attachments that clip onto your natural teeth. 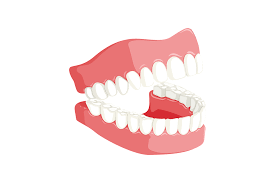 Partial dentures are a removable replacement teeth option and you actually do remove them for cleaning and sleeping. Dentures are custom-made replacements for missing teeth and replace an entire arch of teeth; either upper, lower or both, and generally include those same pink acrylic artificial gums with false teeth mounted into them. And again they are removed for both sleeping and cleaning. Dental bridges, sometimes called “fixed partial dentures,” are artificial teeth that are permanently affixed in your mouth. They’re usually secured by being bonded to neighboring teeth and typically consists of an artificial tooth flanked by two crowns that are placed over the neighboring teeth. Sometimes bridges are attached to dental implants, especially in cases with multiple missing teeth or there are no stable neighboring teeth. Bridges can be made from either made from all-ceramic, ceramic-on-metal, and all-metal but this usually just depends on your preferences, where the crown will be located, and your dentist’s recommendation. At Clarity Dentistry, our goal is to ensure that the very best tooth replacement solutions are presented to help you restore natural chewing function and redeem your smile. To provide the best dentures in Indianapolis, our office is outfitted with the latest technology. Dentures, both full and partial, are made to fit well and to look as natural as possible. We also strive to create your dentures to be as cosmetically appealing as possible, giving you a more youthful smile! And of course, getting dental crowns in Indianapolis, IN is highly effective for restoring broken-down teeth or replacing missing teeth. With Clarity Dentistry’s In-House Dental Plan, for a small annual fee, you can receive free exams, free cleanings, and free x-rays during the year. You’re also automatically eligible to receive discounts on dental services such as fillings, crowns, dental bridges, and even veneers!